And so it goes with the skepticism. Yes, believe it (or not), vinifera grapes are being grown on Vancouver Island. Really though, it shouldn’t be so much of a stretch for anyone who has any sense of geography. We’re talking significant micro-climates on an island the size of Taiwan off Canada’s west coast that has the mildest average climate in the country, and receives 40% less rain than the Lower Mainland. It’s no wonder then that it’s more than possible to grow excellent quality grapes, and to craft delicious wines from them. So, if you’re local, pick up a bottle. If you’re not, check in with me and maybe I can get one to you. Either way, give this one a try. On the eyes, it’s a very pale lemon with delicate aromas of nectarine, citrus and lemon grass with rocks. The palate is dry with good acidity and flavours of more nectarine, lime zest, pink grapefruit, dried herb and rocks. This is all complimented by a kick of significant almond on the back end. A WSET Good plus Canadian wine, eh. Available at leading restaurants, private liquor stores throughout BC, and at the winery. 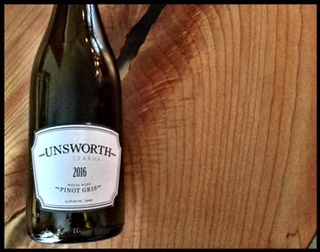 This entry was posted in British Columbia, Pinot Gris, WHITE and tagged 2016, BC, Canadian wine, pinot gris, Unsworth Vineyards, Vancouver Island VQA, white wine. Bookmark the permalink.